Six points to consider before you set the date. As much as we may want to be at that stage, working on potty training can be uncomfortable. In some ways, raising a toddler in diapers is a lot easier than those early days, when we’re just starting potty training. It certainly is more familiar. So it may be wise to do a little planning; see how this “project” is going to affect you and the household, and with that in mind –- schedule to start potty training when it is the most suitable, for you and the family. 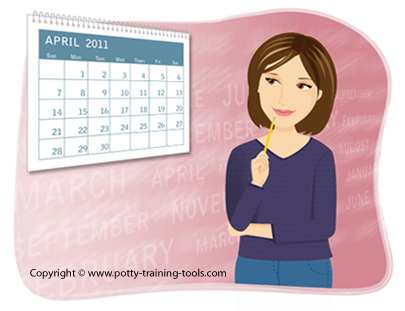 Here are some points to consider while planning when to potty train: (This is not a list of instructions – only a few points that can help you pick a starting date that best fits your reality). Make time for it: You want to be there yourself. Don’t delegate to babysitters or nannies when you’re just starting potty training. If you work outside the house, plan to take a couple of days off work, or potty train over a long weekend. One great option is to start potty training on Thursday and continue it over the weekend. It gives you some continuity, which is important if you are a working mom, and especially if your toddler is already in some form of daycare. Indoor potty training: Staying within the home premises in the first two days is essential for establishing those basic potty or toilet habits, which at this point may be completely new to your child. It would be good to postpone any kind of outdoor plans for later; the 3rd day, maybe the 4th – based on the progress, and your intuition. Free your mind: As much as possible, make yourself mentally and emotionally available for potty training. You’ll need your patience and your mommy-skills to potty train with confidence and ease. If for any reason you find yourself in a stressful time in your life, it may be a good idea to postpone a little. Think “Project”: Think of potty training as a small project, that has a starting-date, an end-date, and a clear plan. If you think about letting your child gradually “experimenting” diaper-free afternoons every now and then – don’t. It will drag the process and miss the purpose. Physically available: During the first couple of days, potty training a toddler can be quite demanding, and it will tie you physically. You’ll want to closely “monitor” your child, and that means making yourself physically available. If you’re normally busy with a small baby or with household, get some help; Have a babysitter or a family member taking care of the baby, keeping your hands free for your potty-trainee. Make time to absorb: Planning when to potty train, you may also want to leave enough time for your child to “absorb” this new skill, if you’re heading towards a big change such as starting Daycare. For example if you’re potty training in the summer, towards starting Daycare in the beginning of school year – plan to have at least two weeks after potty training; give it enough time to really “sink in”.